Size: 8HP. Current: +12V = 150mA. -12V = 30mA.I think it is no surprise that although classic vintage monosynths usually have filters revered for their foibles, they tend to only come with one, whereas they are equipped with three oscillators (or at least two, and sometimes four) as raw input for it. Of course Eurorack does not limit you to this format, but I’d suggest that even if what you make with your modules isn’t necessarily melodic, you probably use a VCO somewhere along the line — maybe for audio-frequency modulation, or in the guise of a VCLFO. Back in the early 1990s when Dieter Doepfer first launched his Eurorack concept, he set out his shop with a basic collection of modules sufficient to get started: VCO, VCF, ADSR, VCA, LFO and ancillary mixers, mults and a few clever clock-trig devices. There were then two versions of the VCO, a basic 10HP A110 module and a 14HP ‘high-end’ A111. Both offered four simultaneous waveform outputs, with CV inputs for pitch, pulse-width modulation, linear and exponential frequency modulation, and sync inputs (but no soft-sync option on the A110). Both came with a seven-octave selector switch, a tune knob (about an octave) and a fine tune on the A111. The A111 was soon discontinued , maybe because the A110 provided nearly all one might need from a VCO, and 14HP was distinctly lavish on rack space — especially if you were looking at three of them. So for 20 years or so the A110 has been their basic voltage-controlled oscillator. Perhaps aware that there were more possibilities for VCO modules, Doepfer have very helpfully now released three new versions: a 4HP A111-3 ‘micro’ VCO, an 8HP update of the A110, and a re-jig of the old A111. I’m going to take a quick look at the new A110-2. The first thing to note is that this is an 8HP unit, though it has the same number of knobs and sockets as the old 10HP oscillator, making an instant saving in rack real estate. Simultaneous sawtooth (erroneously shown as ramp on the panel graphics), square/pulse and triangle waveforms are output at predictable pitches, which will depend on the voltages input to a 1V/octave input socket. Doepfer say their old seven-octave selector switch was expensive, and so have replaced it here with a simple three-way, plus-and-minus one octave switch that, coupled with a five-octave range on the tune knob, should serve adequately. 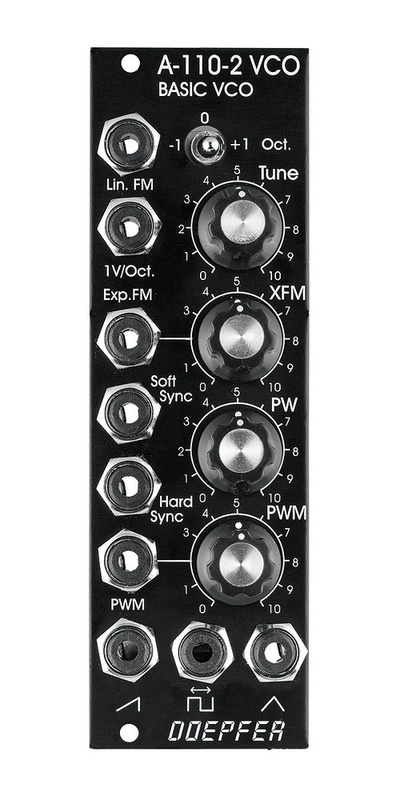 There is a knob to manually change the duty cycle of the square wave output (aka the pulse-width) and a further CV input socket and level knob should you want to automatically control this externally (PWM) via an LFO or ADSR, etc. Both linear (ie. 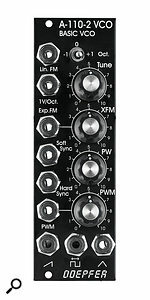 DX7-type FM) and exponential (cross-mod) frequency modulation are simultaneously possible, with a knob to attenuate the amount of the latter. Last up are sockets for soft and hard oscillator sync inputs. The old A110 never had soft sync, so it is good to see it here. Soft sync will pull the pitch of oscillators into tune with each other, whilst hard sync will start to alter waveshapes yielding classic squealing effects if properly abused. So that’s it really. Control voltage in, pitched waveforms out. Nice to see that the revamped A110-2 offers both more features for less space than before, and arguably offers nearly as many features as the A111-2. If minimal is your thing, then the A111-3 takes up only 4HP and still has three output waveforms, sync and PW, FM and XFM inputs. Coupled with the A185 bus access panel, you could have any combination of these VCOs in the way that the venerable Moog Modular did. Available in classic Doepfer brushed aluminium or their Vintage black liveries, these are great utility modules on which to build whatever type of patch you desire, flexible enough to offer both opportunity and accident to the happy patcher. Classic €125, Vintage Livery €140.